The East Super-Regional Championship Tournament will be a 2 division, 4 field competition (2 fields per division). 36 teams are assigned to the Hopper Division, the other 36 teams are assigned to the Tesla Division. Each team will play at least 8 qualification matches. The Winning Alliance from each Division will compete against each other for the East Super-Regional Championship Winning Alliance title. We are celebrating the contributions of Grace Hopper and Nikola Tesla! 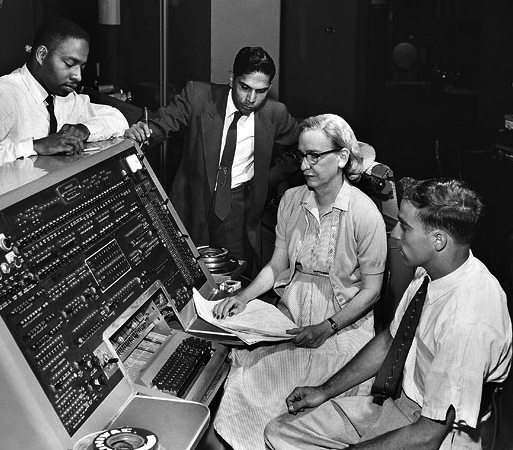 "Amazing Grace" Hopper created modern programming languages and conceptualized and promoted progressive technologies that are used today in computing and communications. She also coined the term "debugging" which is an interesting fact. She was in the Navy for most of her career. Nikola Tesla was an electrical and mechanical engineer. He developed alternating current (AC), built the first hydroelectric dam with George Westinghouse, invented the induction motor, the rotating magnetic field, the Tesla coil, and the radio remote control for torpedoes among many other achievements. The 2017-2018 East Super-Regional Registered Teams are assigned into the Hopper and Tesla Divisions.